Welcome to the Ballinskelligs Inn, Traditional Guesthouse Accommodation on the beautiful Ring of Kerry. 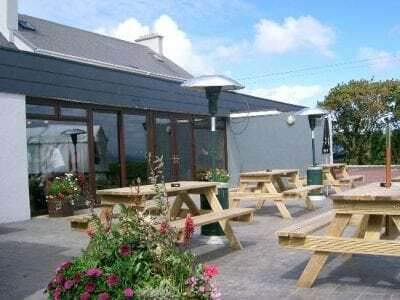 Overlooking the magnificent Ballinskelligs Bay, the Inn is a just couple of steps away from Ballinskelligs Beach which is one of Ireland’s premier Blue Flag beaches making it the ideal location for any holiday or event. We offer friendly service, comfortable accommodation, quality bar food and a real ‘local pub’ - Cable O'Leary’s, a noted traditional music venue very popular with the locals. This part of Ireland is rich in pre-historic and early Christian ruins with breathtaking views of the Atlantic coastline. There is a huge range of activities all within easy reach of the Inn, including boat trips, golf, horse riding, fishing, water sports, cycling and hiking. By far the most sought after event is a visit to the UNESCO World Heritage Site of Skellig Michael, boats travel daily during the season to Skellig Michael from Ballinskelligs Pier. It is one of only two UNESCO sites in Ireland and a visit to this ancient and wonderfully preserved, monastic settlement is considered the highlight of the holiday by most.